At its Board Meeting on December 3, 2015, Metrolinx will receive an update on the ridership for the Union Pearson Express. Previous statistics released by Metrolinx to mid-September were not encouraging with a fairly flat ridership in the mid-2000 range once the initial burst of “try outs” and free rides passed. The new report only extends the published information by about six weeks to the end of October, and the numbers are presented in a way that masks what is really going on. The base of the chart is 60,000, not zero, and so the slope of the chart is more impressive than might otherwise be the case. The ridership is reported on a monthly basis with no correction for the length of each month. 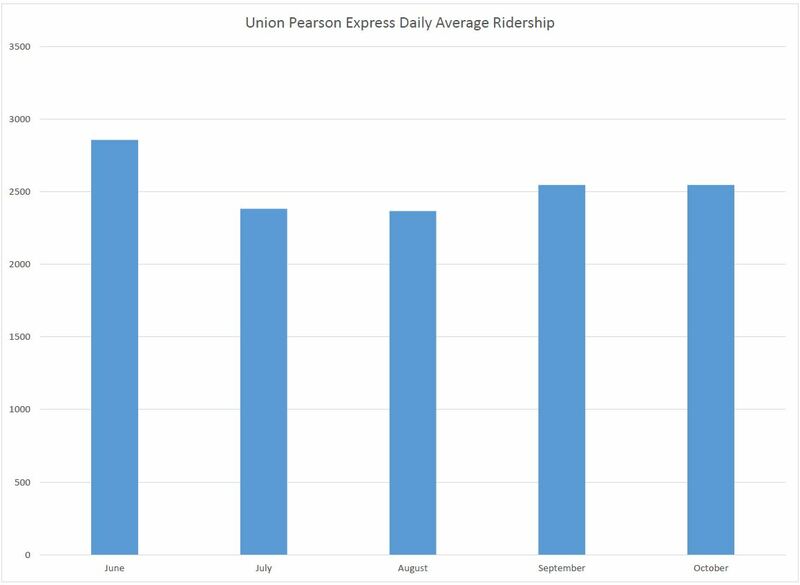 June was a short month with only 25 days of operation, and this included two promotional days with unusually high ridership. October has one more day than September. Plotted as daily averages with a zero base line, things don’t look quite the same. There was a drop off in the summer with July and August relatively flat, and a slight increase for September and October, roughly 7% but over a two-month period. The real question is where do things go from here? 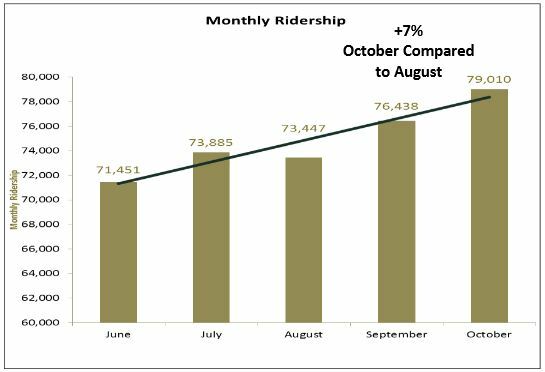 To reach the target of 5,000 riders/day at the end of the first year’s operation will require almost a doubling of daily ridership over the period from November 1, 2015 to May 31, 2016, or a sustained growth of about 14% each month. Metrolinx just completed an airport ground transportation survey this fall which found that 70% of all travellers make decisions about ground transportation modes based on past habits or they have the decision made for them. This is regardless of whether they are flying to or from a home airport. Only 20–30% of travellers did research or saw/heard information prior to departure and this was mostly related to the destination airport. The findings underscore how deeply engrained travel habits are and the significant work required to successfully change these behaviours. This is consistent with what we have been told by other international air rail links – changing entrenched travel behaviours of both local and visiting air travellers takes time. Before UPX launched, Metrolinx did extensive reviews of the air-rail link industry, and yet somehow this basic principle, the difficulty of getting people to change habits, escaped their notice. Marketing efforts include a UPX presence at the terminal stations, trade shows and special events. Metrolinx has tinkered with the fare structure on UPX, although the trips are still quite expensive. An appendix setting out the recently modified structure is missing from the online report, but the fares can be viewed by wandering through the website for standard, employee, and group/corporate tariffs (although the latter contains no information about the discounts actually available). The service was forecast to hit 5,000 passengers a day by next summer, about twice the current ridership. [UPX President Kathy] Haley suggested on Monday that the forecast might be flawed, because it predated Uber, and hinted that the ridership goal could be in flux. The possible effect of Uber, let alone the idea that the goal of 5k/day in ridership, does not appear in the report to the Metrolinx Board. It is hard to believe that a service, routinely promoted as a premium quality line with fares to match, should be at the mercy of lowly Uber. Is the market is not quite so upscale and immune to price as we have been led to believe? Are there not enough of that class of traveller to make UPX pay? Metrolinx has yet to release any financial data on the line’s performance, and we are unlikely to see this until their next annual financial reports (which subdivide results by operation division within the agency) due in mid-2016. The explanations, the excuses, for poor performance of UPX have all the earmarks of a service that was over-hyped from the outset to justify its design and cost. One question Metrolinx must answer is why they need so many staff, so much marketing, to attract riders to a line that was supposed to have demand come to it so easily. This route is on a par with a minor TTC bus route. 126 Christie has roughly the same daily demand, but it does not command an army of greeters, let alone its own President. Remember when the airport link was to be a private sector project with no public money? Pearson Airport is a major regional hub, second only to Union Station for daily passenger volume. Transportation to the airport and surrounding districts should address travel from a wide variety of origins, not just downtown. Service and fares should reflect that the majority of this travel is a combination of ordinary commuting and air travellers, each with their own needs that the network must support. Metrolinx should concentrate less on its showcase, premium fare service to Union, and more on making the airport a major transit destination for the GTHA.